Wyoming is the 5th driest state and drought is a constant threat in our region. 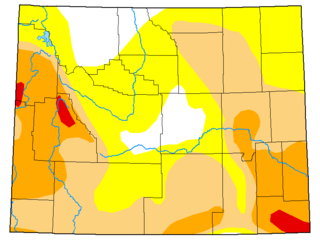 Since 1999, much of Wyoming has been gripped by moderate to severe drought. The intensity of this drought event has varied from year to year, and counties or regions within the state have experienced varying levels of drought impacts. However, this drought has been a significant event by any measure, and we will continue to feel its effects for years to come. Conditions have eased somewhat in mid-2008, but resumed again in 2012 for a period of about two years. After another period of better times in 2014 and 2015 we are once again seeing Severe and Extreme drought making a presence in Wyoming.